I’ve written on how to enable Filestream and how to add a filegroup, but I haven’t touched the Filestream impact on your tables. This post will look at the table side of Filestream and how you get your binary data into the database. Let’s assume you have a filestream enabled database. If you look at my File and Filegroups post, you’ll see how to do this. Given that, we now need to create a table and add data to it. Filestream doesn’t have a separate entity like Filetables. Instead, the Filestream attribute is added to a column in a table, much like the identity property. I’ll create a simple table that holds Filestream data. Here we are creating a basic table that has an ID and name, which are essentially meta data for our filestream data. You could have any amount of information in this table, but the Filestream data is stored in the jpg field, where we have a varbinary(max) datatype, and the FILESTREAM attribute on the table. To add data to this table, we have a variety of choices using T-SQL. 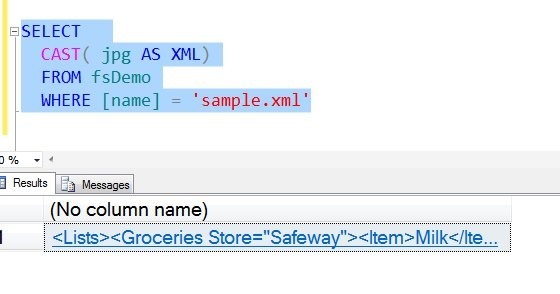 It’s possible to use an application, and pass in parameters that are streamed to the table, but for the simplicity of this example, let’s show two ways in T-SQL. The other method I can show is a direct insert, streaming from the OPENROWSET command. Here I’ll pic an image on my system and insert it. Once this is done, the data is in binary, as I see from the selection from the table. However if I cast this result back, I get the data as expected. Hopefully this helps you to understand how to insert data into a Filestream table. In another post, I’ll look at how you can extract this data for rendering. This entry was posted in Blog and tagged Filestream, sql server, syndicated, T-SQL. Bookmark the permalink.